The Dolomites, an area rightly popular for walking holidays in Italy's north-east province of Belluno, is named after a French scientist called Dolomieu. It was Dolomieu who first studied the local limestone rock that forms the distinctive scenery you'll find in this region of Italy. Hiking between these limestone giants you'll find Eden-like, green valleys, lined with rolling meadows and wild, alpine flowers. But it will be the dramatic triangular peaks that make you appreciate the awesome power of the glaciers that shaped these mountains. Rome is fairly packed with ancient and classic sights for the eager visitor to discover and explore. From basilicas to squares and ancient structures to eye-catching fountains, you will most certainly never be bored when you visit this beautiful city. Walking in Italy really does come into its own when you decide to explore the capital on foot, and around every corner will be something new. Anyone walking in Italy is likely to have cause to visit at least one site that has been granted UNESCO World Heritage Status. This status is given to those areas and places that should be preserved for their beauty, their history and their contribution to the world. 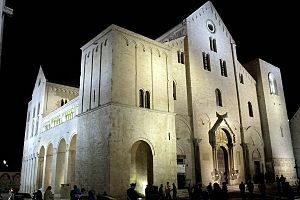 Southern Italy has an impressive selection of World Heritage Sites for you to see. They are probably best seen on a guided walk with an experienced tour leader, since this will enable you to learn more of the history of each location. Are you ready? Grab your walking shoes and try these for size. Wine and Walking in Italy There's more to the wine region of Tuscany than the much-coveted Brunello. The wine buffs would tell you that from the 1980's Tuscany has been producing new wines called Super Tuscans that have found international popularity. 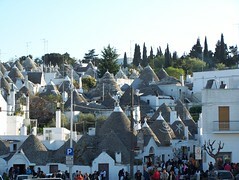 It's not uncommon to combine wine and walking in Italy into wine-tasting and walking holidays. There are many people who go walking in Italy for the sights and cultural experiences on offer - however, there are others interested in discovering Italy's history while on foot. One of the most interesting events to have befallen the ancient occupants of Italy was the eruption of Mount Vesuvius, and the annihilation of Pompeii. Many scholars of ancient history are interested by the volcanic eruption and the remains of the city that can be discovered to this day. Whether you have a passing interest or you're a keen historian, the tale of Pompeii is absolutely fascinating. 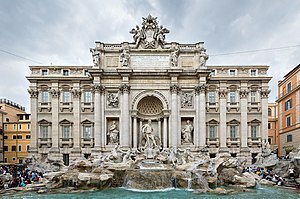 Walking in Italy can either be the best tourism-related decision you've ever made, or it could be your most tiring travel - with many more hours spent finding the right street or cobble-stoned alley, train, bus, or subway ride than in enjoying the delightful things the country has to offer. But with the help of well-experienced tour leaders, your exploration of the country's famous cities can become one of your most memorable adventures. Spain is a nation that is both passionate and charming. Go beyond its vibrant fa�ade and you will find a country that is bursting with history, culture and heritage. It has got style, flair and everything else to keep an outdoor enthusiast, a beach goer, and a culture vulture satisfied. There are several reasons to visit Spain. Here are just five of them. For many people, London conjures images of Buckingham Palace, the Tower of London, Oxford Street and huge crowds of people. For those who want to explore the great city on a path less travelled though, there many sights which are equally as beautiful and wondrous as the famous landmarks. These well kept secrets of London give tourists the chance to experience a magical London in an intimate way without having to compete with jostling crowds. Denmark's capital, Copenhagen has enjoyed this status since the 15th century. With the meandering of time and history through this region, the city has emerged as a hub of trade, business and culture. There are plenty of things to do and see for the traveler here and one way of enjoying this city is to avail of the cheap plane tickets that almost every airline company offers. Availing the airline deals also makes perfect since the airport of this city – Kastrup is just a few minutes away from the city center. The locals call their city ‘friendly old girl of a town' and it is the perfect description of this destination. There is something warm, inviting and downright amicable and amiable about the city. Perhaps it is the fact that it is one of the greenest cities, in terms of eco-friendliness, in the world. Or perhaps it is the fact that the citizens here take their green conscience very earnestly. Openhouse Chicago, a set on Flickr. Italy has many different faces and plenty of luxury hotels from which to enjoy them. From the chic sophisticated fashion houses of Milan and the historic treasures of Venice and Rome to the rolling hills of Tuscany, there is something to suit every visitor. Add superb cuisine and world class wine and cheese and you are in for a gastronomic treat too! Once the seat of the powerful Roman Empire and the home of the Vatican, Rome has an unrivalled history. Ancient monuments, churches and Renaissance palaces hold priceless artworks, murals and treasures, making this a must-see destination. Whether you are interested in ancient history, art, architecture or fashion, Rome has it all in abundance. Listed by Frommers as one of the best luxury hotels in Rome, the St Regis Grand is a truly opulent five star luxury hotel on the Via Vittorio Emanuele Orlando. This opulent Roman palazzo is lavishly decorated with sumptuous furnishings, murals and glittering chandeliers in Belle �poque style. Venice is one of the loveliest places to visit in the world. Located on a lagoon, its compact streets seem unchanged from 600 years ago. Get around by vaporetti or private water taxi or splash out on a gondola ride, the epitome of Venetian romance. Enjoy all the sights on Piazza San Marco including the Basilica, Bell Tower and the Doge's Palace. After a hard day's sightseeing, retire to one of the best luxury hotels on Venice's Lagoon. The Cipriani is on the small island of La Giudecca, minutes away from St Mark's Basilica by water taxi. Relax in the gardens, cool off in the swimming pool and enjoy the views of Venice as the sun sets over the city skyline. Florence is truly an art-lover's paradise but when you have had your fill of world-class art galleries, murals, the Bargello Museum and the Galleria del'Accademia, there is still more to enjoy. The cobbled streets and piazzas hide medieval towers, fountains, monuments and countless churches. The Duomo is the pi�ce-de-resistance with its magnificent dome, baptistery and bell tower. The gorgeous converted medieval monastery at the Villa San Michele is sure to appeal. With a fa�ade designed by Michelangelo, this luxury hotel in Florence is surrounded by park and woodland and overlooks the city from its unique hillside location. Alex Brey co-founded Luxique, and has had a passion for travel for more than 20 years. So much so, he convinced others to join him in his pursuit to create a travel documentary highlighting some of the globe's finest destinations. During an almost three year process, he got to stay in some outstanding luxury hotels, soak up some vibrant cultures and enjoy some of the world's finest cuisines. He realized that the decision-making process for planning the perfect trip - from choosing the destination to getting the right hotel room - was something that could be improved. And so came the birth of Luxique, the website that caters for the discerning traveler. The 23rd edition of ArtePadova is nearly hear: the trade exhibition dedicated to modern and contemporary art that takes place every year in the venetian city, and that has become a must for galleries, collectors, art experts but also for art lovers, will start on the 9th of November and will be open until the 12th at PadovaFiere as usual. Through the years ArtePadova has made a name for itself as a benchmark from both a business and artistic point of view, and in this sense Padua is the most suitable location, due to its long and famous artistic tradition as well as to its role as important business centre. Many visitors, for both business and cultural reasons, decide to visit ArtePadova, and it is no coincidence that the number of participants is increasing year after year. Over 20,000 people have visited the trade exhibition last year, and about 150 Italian and international galleries have exhibited their works, which has created an important artistic hub on an exhibition area of about 23,000 m.
well-known artists as well as by emerging talents, to give space to the great artists of the future. In this way ArtePadova offers a journey into the art history of the 20th century and of 2000 through some of the most representative works of art of these periods. Some of the halls and pavilions of the exhibition are notably interesting: halls 7, 8 7, for example, contains very high-level works, but all the spaces of the fair will give you the chance to breathe art deeply. And to highlight the effort and the will of ArtaPadova to give space also to emerging talents, three halls will be put at the disposal of young artists that wish to make themselves known in the art market: this is the initiative CATS: Contemporay Art Talent Show. The peculiarity of ArtePadova comes from its capacity to connect the world of art with other sphere and fields, and this does not only means business, galleries and collecting. The link and connections between art and other sectors will be highlighted also through a series of meetings and round tables that are meant to examine some notably interesting issues, like the connection between art and fashion, art and technology and art and architecture. The art-talks are back also this year: a series of meetings and debates that are meant to look into the various facets of the world of contemporary art thanks to the intervention of experts like curators, journalists and critics. In addition to these meetings, which will take place at PadovaFiere, ArtePadova will also offer other interesting initiatives that will be held outside the fairground, bringing art to the city. After the inauguration, which will take place on the 8th of October, you can visit ArtePadova from Friday to Sunday from 10 a.m. to 8 p.m. and on Monday from 10 a.m. to 1 p.m. If you are still wondering where to go for your honeymoon, trying to take into consideration all the pros and cons different destinations offer, you should opt out for the place that speaks love and romance all the way through - from its people to the cobbles in its tiny streets. It sounds familiar, right? Italy, of course. Italy has become synonymous with romance, and for the last decades, Italy honeymoons have been widely preferred as the perfect destination for romantic entanglements. Young couples and newlyweds often choose Italy honeymoons because they somehow believe, or at least hope, that their love could be of the kind with which romance and passion speak their true names and are there to stay.